1) Installation d’une cabine téléphonique publique dans toutes les prisons afin de communiquer avec leurs proches. - Autoriser l’entrée des enfants et des mineurs de moins de 16 ans à chaque visite. - Ne pas faire supporter le coût du traitement au captif. 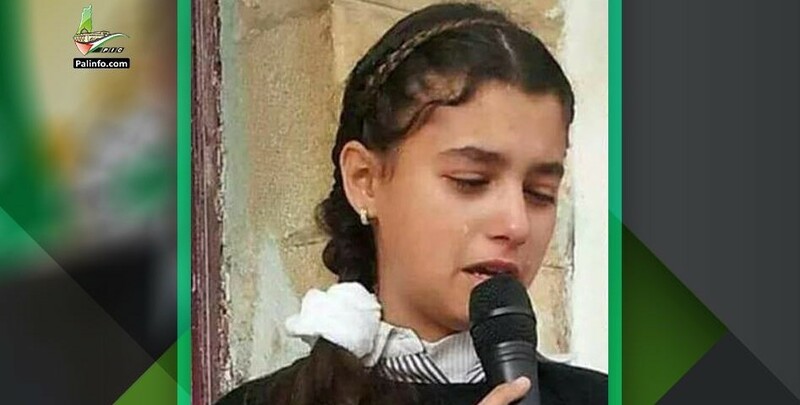 4) Répondre aux besoins et aux demandes des prisonnières palestiniennes, que ce soit durant le transport individuel ou pour la rencontre directe sans barrière lors de les visites familiales. - Permettre aux prisonniers de s’inscrire officiellement et de façon convenue au baccalauréat. Starting from tomorrow Monday 17/4/2017, thousands of Palestinian prisoners in Israeli jails will stage an open-ended hunger strike, to demand their dignity and rights. 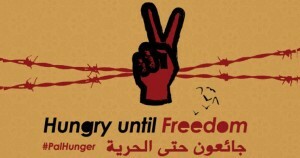 The start date of the mass hunger strike also marks Palestinian Prisoner Day. The prisoners are hoping with this step to gain their basic rights, which the Israeli Prison Service deprives them of and which they had earlier achieved through a series of hunger strikes. The hunger strike is a continuation of 23 mass hunger strikes the Palestinian national prisoners’ movement has launched in the Israeli jails since 1967, the latest of which was the mass hunger strike launched by Palestinian administrative detainees in Israeli jails in 2014, which lasted for 63 days. Furthermore, Palestinian prisoners staged dozens of other hunger strikes, both en masse and individual hunger strikes, most important were the hunger strikes launched to protest administrative detention, which had seen a rapid increase recently. The supreme leadership of Hamas’s prisoners in Israeli jails announced its full support for the hunger strike, which the prisoners plan to stage to gain their rights and to defend their dignity and freedom. The Hamas leadership stressed in a statement that Hamas’s prisoners will join the hunger strike at Hadarim prison hand in hand with their other bothers from other factions. There are 6,500 Palestinian prisoners in Israeli jails, 58 of them are women, 300 of them are children, 500 of them are administrative detainees (held without charge of trial), and 1,800 of them are suffering various diseases. 1. To install a public landline for all prisoners at all prisons and departments which allow them to contact their families. A. To resume the second family visit, suspended by the International Committee of the Red Cross. B. To have a family visit twice a month and not to allow it to be interrupted by anybody. C. To allow all first-degree and second-degree relatives visit their imprisoned relatives. D. To increase the family visit’s duration from 45 minutes to an hour and a half. E. To allow the prisoners to have a photograph with their families every three months. F. To build necessary facilities at the prisons’ gates to provide comfort for visitors and families. G. To allow children and grandchildren under the age of 16 during family visits. A. To shut down the so called Ramla prison hospital, because it lacks necessary equipment and medication. B. To end medical negligence. C. To allow regular medical checks. D. To allow immediate surgery for needy cases. E. To allow specialist doctors to check on prisoners from all medical fields. F. To release handicapped prisoners, prisoners with special needs and chronic diseases. G. To exempt prisoners from the cost of medication. 4. To positively respond to the demands and rights of Palestinian female prisoners, including special transfers to other prisons or direct meeting with family members, without having a physical barrier during the family visit. A. To treat prisoners in a humane manner while transferring them in the Bosta. B. To return prisoners visiting clinics and courts to prisons, and not to keep them at barriers. C. To prepare barriers for human use, and to provide meals for prisoners. D. To add TV channels which suit the needs of prisoners. E. To install air conditioners in prisons, especially in Megiddo and Gilboa prisons. F. To re-install kitchens at prisons and to make them under full Palestinian supervision. 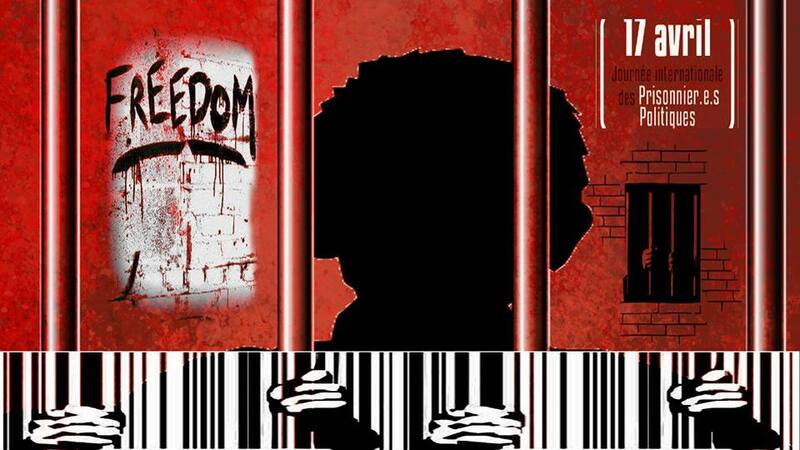 G. To allow books, newspapers, clothes, foods, and the special items for Palestinian prisoners during visits. H. To end solitary confinement policy. I. To end administrative detention policy. J. 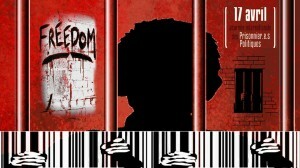 To re-install the education program at the Hebrew Open University for Palestinian prisoners. K. To allow Palestinian prisoners sit for high school exams in an official manner and as agreed. “Some 1,000 Palestinian prisoners have decided to take part in this hunger strike, which begins today, the day we observe here as Prisoners’ Day. 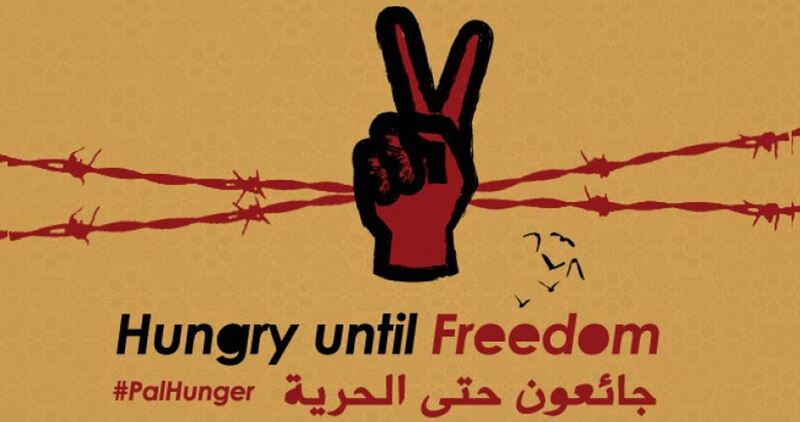 Hunger striking is the most peaceful form of resistance available. It inflicts pain solely on those who participate and on their loved ones, in the hopes that their empty stomachs and their sacrifice will help the message resonate beyond the confines of their dark cells. “On the occasion of Palestinian Prisoners’ Day, we salute every prisoner, the heroes and heroines of the battles of will and steadfastness, to every flower and cub, to the sick prisoners, administrative detainees and imprisoned leaders, led by the imprisoned General Secretary, Comrade Ahmad Sa’adat, Marwan Barghouthi, Hassan Salameh, Wajdi Jawdat, Anas Jaradat, Bassam Kandakji and the long line of leaders who represent the national struggle and the prisoners’ cause. On this occasion, we make a particular salute to the martyrs of the prisoners movement and to all of those engaged in confrontation and the struggle for victory. We are firmly committed to see each battle of confrontation with the Prison Service and its instruments of repression and intelligence agencies as a collective battle. Every action initiated by any faction is all of our battle….In this context, we affirm that we stand hand in hand and shoulder to shoulder in any struggle waged by the prisoners, and we consider the decision to engage in the battle of dignity and honor against the jailer, beginning on Monday, April 17, Palestinian Prisoners’ Day 2017, to be one which we support and which we are part of. This comes in two ways, both through the decisions and guidelines for the comrades to engage in the battle, and through approving a program of support for the strike in all prisons and among our comrades outside. The prisoners’ leadership of Islamic Jihad confirmed that nearly 100 prisoners of Islamic Jihad, including 52 in Nafha, 13 in Hadarim and 30 in Gilboa, are participating in the hunger strike from 17 April. “Palestinian political prisoners are systematically subjected to torture and ill treatment with continued impunity – highlighting the need for the international community, as well as individuals, to intervene and call for immediate protection for these prisoners and detainees, long-denied basic rights. While Palestinian prisoners are about to launch a hunger strike to end Israel’s ongoing violation of Palestinian prisoners human rights, including its rejection to fulfill its obligations in accordance to provisions of third and fourth Geneva conventions, the international community is asked to fulfill its responsibility through tangible and practical measures to ensure the protection for prisoners legitimate struggle and human rights. “1300 prisoners begin today the battle of empty stomachs. 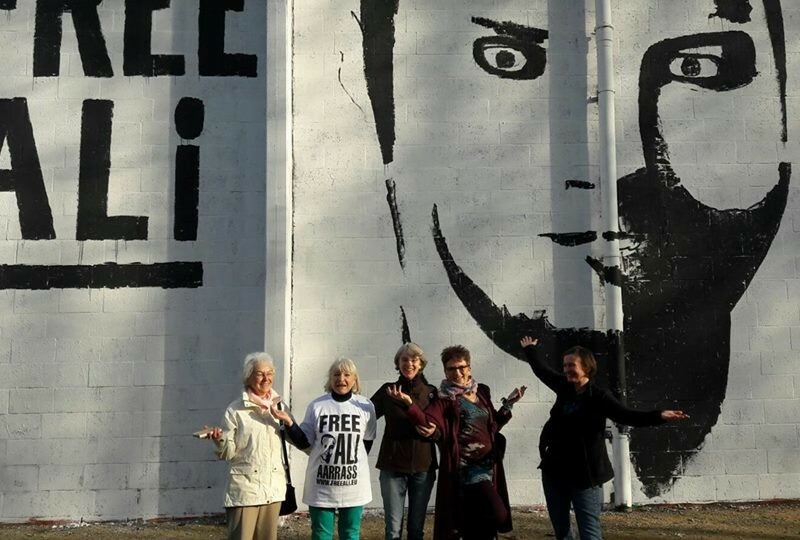 This battle requires a wider solidarity campaign from us, to raise the attention of public opinion to the suffering of imprisoned freedom fighters under repression and abuse in prisons. 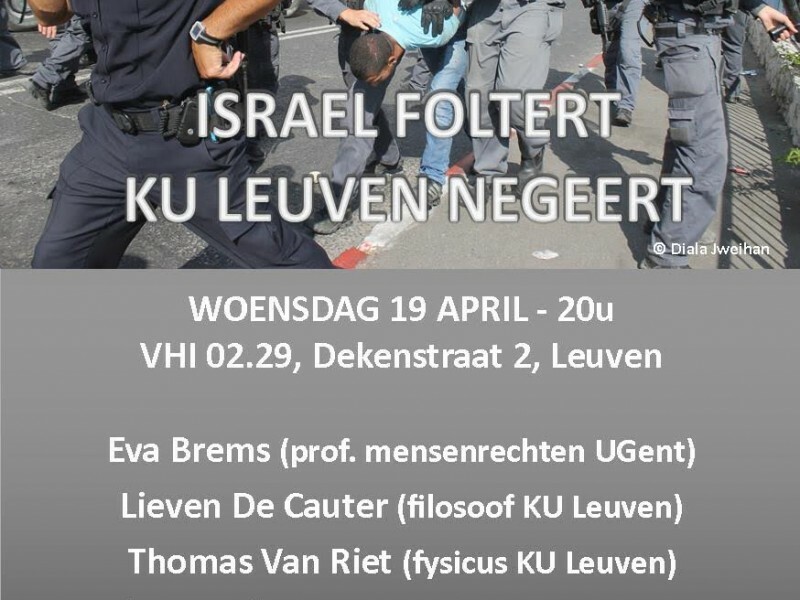 Les techniques d’interrogation israéliennes bientôt en Belgique ? Stop le projet law train !